A study published in the American Journal of Transplantation found that chronic dialysis patients in Ontario have unequal access to kidney transplants. These patients with kidney failure will be on dialysis their whole lives unless they receive a transplant. When the research team looked at all the kidney transplants that took place in 27 of Ontario’s regional kidney care programs from 2003 to 2013, they found that transplant rates ranged from 7.4 to 31.4 percent across programs. 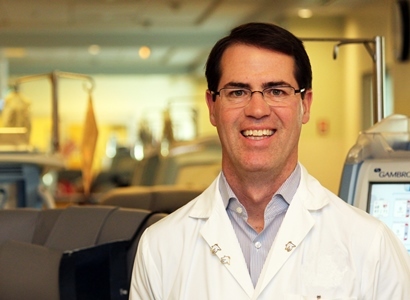 “In theory Ontario has a universal health care system, but our study found that patients registered in some regional kidney programs were more likely to receive a transplant than others,” said senior author Dr. Greg Knoll, a senior scientist and Head of the Division of Nephrology at The Ottawa Hospital, and Chair in Clinical Transplantation and professor at the University of Ottawa. When the researchers only considered those patients most eligible to receive transplants, the transplant rate ranged from 32.5 percent to 82.7 percent across programs. These 1,809 most eligible patients were aged 18 to 50 and did not have a history of cancer, diabetes or heart disease. “We already knew there were major differences in kidney transplant rates between the provinces, but this is the first time researchers have looked within one province,” said first author Dr. Kyla Naylor, a postdoctoral fellow at the University of Toronto and the Institute for Clinical Evaluative Sciences. Further analysis found that 15 of the 27 regional kidney care programs performed kidney transplants at the expected Ontario rate. Six programs had a higher transplant rate than expected, while another six had a lower rate than expected. The researchers do not know why this variation in transplant rates exists. Some possibilities include different transplant referral rates, the amount of transplant education provided, staff-to-patient ratios, as well as the proximity of the nearest transplant centre and their supply of organs. Of the 23,022 chronic dialysis patients tracked during this study, 46.1 percent died and 11.8 percent received a transplant during a maximum follow-up of 11 years. According to the Trillium Gift of Life Network, there are over 1,000 people on Ontario’s kidney transplant list. This study used data from six different databases that are held at the Institute for Clinical Evaluative Sciences, including the Ontario Renal Reporting System, the Canadian Organ Replacement Register, the Ontario Registered Persons Database, the Ontario Health Insurance Plan Database, the National Ambulatory Care Reporting System and the Canadian Institute for Health Information Discharge Abstract Database. Full reference: Variation in Access to Kidney Transplantation across Renal Programs in Ontario, Canada. Kyla L. Naylor, Stephanie N. Dixon, Amit X. Garg, S. Joseph Kim, Peter G. Blake, Gihad E. Nesrallah, Megan K. McCallum, Christina D’Antonio, Alvin H. Li, Gregory A. Knoll. American Journal of Transplantation. January 9, 2017. Funders and supporters: Ontario Renal Network, Ontario Ministry of Health and Long-Term Care, ICES Western (a satellite site of the Institute for Clinical Evaluative Sciences), Academic Medical Organization of Southwestern Ontario, Schulich School of Medicine and Dentistry Western University, Lawson Health Research Institute, The Ottawa Hospital Foundation, University of Ottawa, Canadian Institutes of Health Research, Canadian National Transplant Research Program. See full paper for further details on funders. About The Ottawa Hospital: Inspired by research. Driven by compassion: The Ottawa Hospital is one of Canada’s largest learning and research hospitals with over 1,100 beds, approximately 12,000 staff and an annual budget of over $1.2 billion. Our focus on research and learning helps us develop new and innovative ways to treat patients and improve care. As a multi-campus hospital, affiliated with the University of Ottawa, we deliver specialized care to the Eastern Ontario region, but our techniques and research discoveries are adopted around the world. We engage the community at all levels to support our vision for better patient care. See www.ohri.ca for more information about research at The Ottawa Hospital.